Retinal capillary hemangioma (RCH) is a benign retinal tumor defined by a vascular proliferation localized in the peripheral retina, juxtapapillary retina, or the intraneural portion of the optic nerve. In most cases, diagnosis of RCH is performed by fundus evaluation and confirmed by fluorescein fundus angiography. Nevertheless, a small RCH localized on or adjacent to the optic nerve head could be difficult to detect by fundus examination. 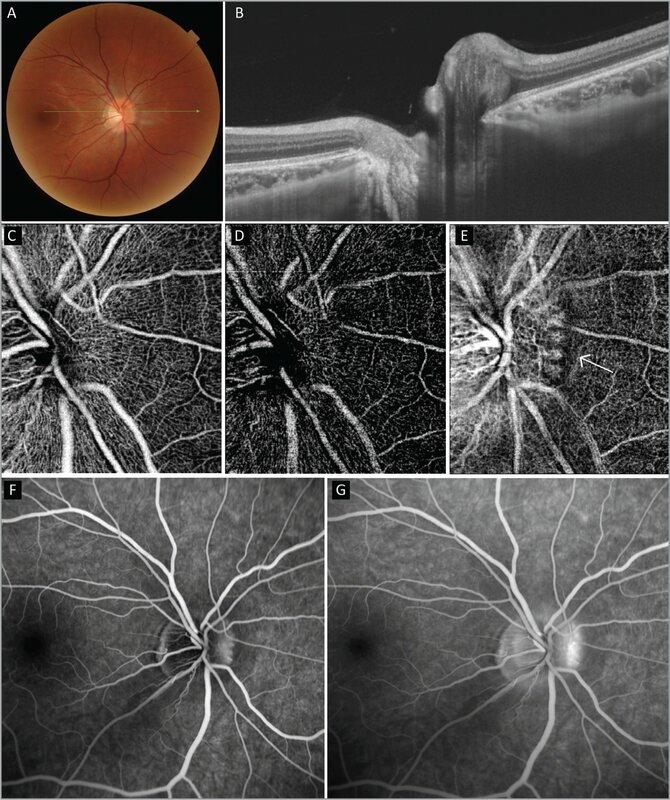 Here, the authors report an atypical case of RCH, not ophthalmoscopically visible, but successfully detected first by optical coherence tomography (OCT) and then by OCT angiography, which confirmed its vascular nature. Ophthalmoscopically, a RCH is a round, orange-red lesion with feeder vessels. The diagnosis is based on fundus examination and is confirmed by fluorescein angiography (FA). In this report, we describe an unusual retinal capillary hemangioma studied by multimodal imaging, including optical coherence tomography angiography (OCTA). A 25-year-old Caucasian woman with no previous ocular history presented with metamorphopsias in the right eye 3 months ago. She underwent best-corrected visual acuity (BCVA), fundus biomicroscopy, FA with a confocal scanning laser ophthalmoscopy (Spectralis HRA+OCT; Heidelberg Engineering, Heidelberg, Germany), swept-source optical coherence tomography (OCT), and OCT angiography (OCTA) (DRI OCT Triton; Topcon, Tokyo, Japan). The study adhered to the tenets of the Declaration of Helsinki, and the participant provided written informed consent before examination. BCVA was 20/20 both eyes. Anterior segment findings were unremarkable in both eyes. Fundus examination of both eyes revealed macula and optic nerve head within normal limits (Figure 1A). (A) Color fundus photograph of right eye showing macula and optic nerve head within normal limits. (B) Swept-source optical coherence tomography (OCT) B-scan revealing dome-shaped elevation of neurosensory retina with disorganized architecture in correspondence of the nasal optic disc and with optical shadowing of the choroid. (C–E) OCT angiography of the retinal capillary hemangioma. En face reconstructions show a hyperintense signal localized in the nasal sector of the optic nerve head, suggestive of abnormal capillaries developed within radial peripapillary capillary plexus. (F, G) Fundus fluorescein angiography showing early hyperfluorescence and late leakage and staining of the lesion. No feeder vessels were found, and no optic disc edema was detected. Peripheral vasculature had no obvious abnormalities. The structural OCT of the right optic disc revealed a dome-shaped localized lesion between retinal pigment epithelium (RPE) and neurosensory retina, with a disorganized retinal architecture and optical shadowing of the choroid (Figure 1B). OCTA of the disc presented a nasal circumscribed area at the edge of optic nerve head, characterized by abnormal capillaries detected at the level of radial peripapillary capillaries (RPC) plexus segmentation (Figures 1C–1E). FA of the right eye showed an early filling of the vascular network overlying the optic nerve head and a late leakage, thus confirming the diagnosis of papillary RCH (Figures 1F and 1G). Indocyanine green angiography of right eye did not shown significant alterations. OCT and OCTA resulted within normal limits in the left eye. As reported by Thirumalesh MB et al.,9 the hemangioma was clearly detected by fundus examination and OCTA confirmed its vascularization. On the contrary, in our case, we reported an unusual presentation of the RCH without any apparent sign of vascularization. The small size and deep localization indeed made the hemangioma not detectable by simple fundus examination; only the use of OCT methodologies allowed the identification of this lesion. In addition, OCTA showed the vascular nature of the tumor, revealing vessels' interdigitation in a localized area between the optic nerve and the RPC. This area is the same as the one that showed dilated retinal arterioles and late leakage in FA examination. Then, OCT and OCTA increased the sensitivity for the diagnosis of retinal vascular abnormalities, outperforming the slit-lamp-based fundus examination, thus allowing the final diagnosis. In our case, the small and asymptomatic hemangioma was localized in the nasal area of the optic disc and did not involve the macula. Consequently, no therapy was started, but the patient was assigned to a follow-up program. Bowling B. Kanski's Clinical Ophthalmology. 8th ed. Philadelphia, PA: Saunders Ltd.; 2016. Mitropoulos PG, Chatziralli IP, Peponis VG, Tsiotra VA, Parikakis EA. Photodynamic therapy for juxtapapillary retinal capillary hemangioma. Case Rep Ophthalmol Med. 2014;2014:756840. Saitta A, Nicolai M, Giovannini A, Mariotti C. Juxtapapillary retinal capillary hemangioma: New therapeutic strategies. Med Hypothesis. Discov Innov Ophthalmol. 2014;3(3):71–75. From the Department of Ophthalmology, Scientific Institute San Raffaele, University Vita-Salute, Milan, Italy. Address correspondence to Maria Brambati MD, Department of Ophthalmology, Scientific Institute San Raffaele, University Vita-Salute, via Olgettina 60, 20123 Milano, Italy; email: brambati.maria@hsr.it.